By now you will have realised that the paintings I like the most are ones that have a story behind them. My Daily Art Display today has an intriguing tale attached to it which I will now share with you. The painting is entitled Madame Moitessier and the artist who created this work of art was Jean-Auguste- Dominique Ingres. This painting which was completed in 1856 is housed at the National Gallery in London. It is the date which is interesting as Ingres initially started the painting in 1844! Marie-Clothilde-Inès Moitessier, née de Foucauld, was the daughter of a civil servant. Born in 1821 she married the wealthy banker, and one time importer of Cuban cigars, Sigisbert Moitessier. He was in his forties whilst she was just twenty-one years of age. Two years later, her husband spoke to a friend of Ingres and asked him to speak to the artist about painting a portrait of his new wife, Madame Montessiere. Ingres refused the commission, as to him, portraiture was a “low” form of art and he preferred to concentrate on “history paintings”. However his friend Marcotte persevered with the Monsieur Moitessier’s request and finally Ingres agreed to meet the new wife. Ingres was immediately struck and captivated by her beauty and agreed to paint her portrait. Ingres then made his first mistake by suggesting that Moitessier should include her young daughter “la charmante Catherine” in the portrait. If you look at preliminary sketches of this work, which can be seen at the Ingres Museum in Montauban, you can see the head of Catherine under her mother’s arm. However by 1847 the young child had become so restless, couldn’t sit still for any lengthy period and finally rebelled against any artistic instructions and so, was banished. More bad luck for the commission was to follow as in 1849 Ingres’s wife died suddenly and the artist was devastated and didn’t paint for the next seven months. In 1851, seven years after he started the painting of the seated Madam Moitessier, little progress had been made and the husband became restless at this lack of progress. So that year, after constant cajoling and support from his friends and the demand of the sitter and her husband, he went back to the easel. Ingres started another painting of Moitessier’s wife, dressed in black, this time in a standing position. He completed this at the end of 1851 and this work can now be found in the National Gallery of Art in Washington. After completing the standing portrait of Madame Moitessier he reverted back to the one he had begun in 1844. The lady is sitting in a rather strange pose. Art historians believe that the pose of the lady, hand touching cheek, captured in Ingres’s painting, was reminiscent of the fresco Hercules and Telephus from Herculaneum which Ingres probably saw when he was there in 1814. It is believed that Ingres had the sitter take up this pose but had to convince her husband that it was in keeping with Classical art and it made his wife look more learned and cultured. The husband liked this idea as he was of the nouveau riche and liked the idea that the painting may have people believe they were more akin to nobility. 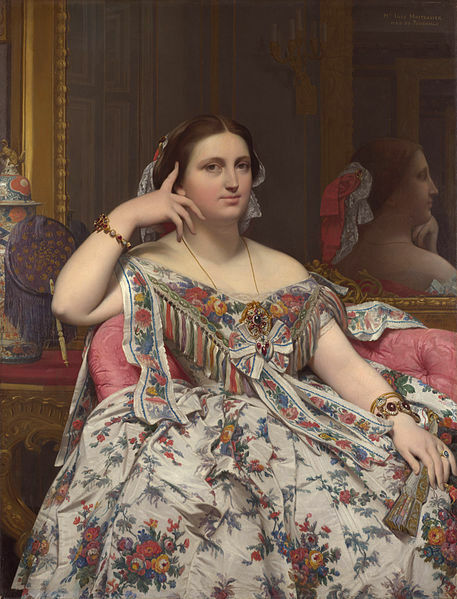 It is also quite amusing to read that Madame Moitessier had gained weight during her pregnancies and had demanded of Ingres that he should re-paint her arms and make them look thinner and thus more flattering! This painting took over twelve years to complete and there are many preliminary drawings of it in existence. Why did it take him so long? I have told you of some problems he encountered during this epic and I suppose we should also remember that he was 76 years of age when he finally completed the work and age may have played a large part in the agonisingly slowness in his progress. Still, now we look at the finished article we must admire Ingres’s work. Marie-Clothilde-Inès Moitessier, née de Foucauld, was the daughter of a civil servant. Born in 1821 she married the wealthy banker, and one time importer of Cuban cigars Sigisbert Moitessier. He was in his forties whilst she was just twenty-one years of age. Two years later, her husband spoke to a friend of Ingres and asked him to speak to the artist about painting a portrait of his new wife, Madame Montessiere. Ingres refused the commission as to him portraiture was a “low” form of art and he preferred to concentrate on “history paintings”. However his friend Marcotte persevered with the Monsieur Moitessier’s request and finally Ingres agreed to meet the new wife. Ingres was immediately struck by her beauty and agreed to paint her portrait. Ingres then made his first mistake by suggesting that Moitessier should include her young daughter “la charmante Catherine” in the portrait. If you look at preliminary sketches of this work, which can be seen at the Ingres Museum in Montauban, you can see the head of Catherine under her mother’s arm. However by 1847 the young child had become so restless, couldn’t sit still for any lengthy period and finally rebelled against any artistic instructions and was banished. More bad luck for the commission was to follow as in 1849 Ingres’s wife died suddenly and the artist was devastated and didn’t paint for the next seven months. In 1851, seven years after he started the painting of the seated Madam Moitessier little progress had been made and the husband became restless at this lack of progress. So that year after constant cajoling and support from his friends and the demand of the sitter that he produced something, Ingres started another painting of Moitessier’s wife, dressed in black, this time in a standing position. He completed this at the end of 1851 and this work can now be found in the National Gallery of Art in Washington. 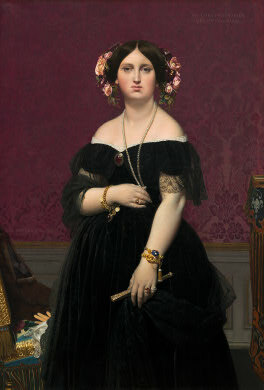 After completing the standing portrait of Madame Moitessier he reverted back to the one he had begun in 1844. The lady is sitting in a rather strange pose. Art historians believe that the pose of the lady, hand touching cheek, captured in Ingres’s painting was reminiscent of the fresco Hercules and Telephus from Herculaneum and which Ingres probably saw when he was there in 1814. It is believed that Ingres had the sitter in this pose, and he had tgo convince her husband that it was in keeping with Classical art and it made his wife look more learned and cultured. The husband liked this idea as he was of the nouveau riche and liked the idea that the painting may have people believe they were more akin to nobility. It is also quite amusing to read that Madame Moitessier had gained weight during her pregnancies and had demanded of Ingres that he should re-paint her arms and make them look thinner and thus more flattering! This painting took over twelve years to complete and there are many preliminary drawings of it in existence. Why did it take him so long? I have told you of some problems he encountered during this epic and I suppose we should also remember that he was 76 years of age when he finally completed the work and age may have played a large part in the agonisingly slowness in his work. Still, now we look at the finished article and must admire Ingres’s work.